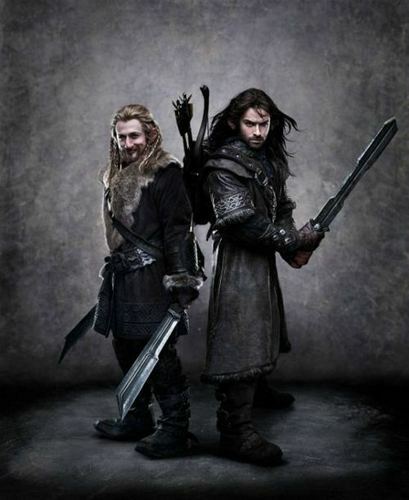 Fili and Kili. . Wallpaper and background images in the द हॉबिट club tagged: fili kili dean o'gorman aidan turner the hobbit: part 1 the hobbit peter jackson. This द हॉबिट photo contains छाती, एजिस, egis, तराजू, जैसे, सीना, तत्वावधान, कवच प्लेट, कवच चढ़ाना, थाली कवच, प्लेट कवच, राइफल करनेवाला, राइफलमेन, and रायफलमैन. There might also be ग्रीन टोपी, विशेष बलों, कुलीन सैनिक, हरे भरे, विशेष बल, हरी टोपी, and अभिजात वर्ग सैनिक. WTF is THIS?! Brand new kind of teenage idols??? I know Fili and Kili are the youngest dwarves from company, but they're not metrosexuals, are they...?? ?